In India it is common to find yourself sharing a freeway with cows, motorcycles, pedestrians and trucks, all zigzagging their way through the roads’ unpredictabilities. What is not common to find in Melbourne, is an array of locally produced beers with a finger-licking list of curries to match with. At this newly opened restaurant, traditional curries like butter chicken or beef madras are super tender and with a sauce that will get you mopping your plate easily. The Punjabi khadi however, is so good you may need to ask for seconds or one to takeaway with you. Its a yoghurt & turmeric based curry with zucchini, eggplant & chickpea flour pakoras. The pakoras are crunchy and spicy and balanced perfectly with the yoghurt’s sourness. 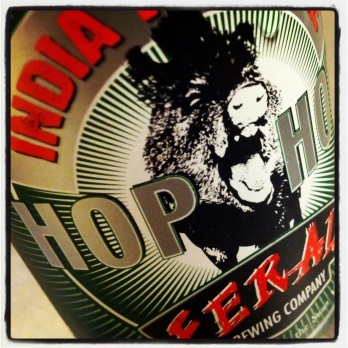 Although it may be difficult to choose from the amazing beer list, its hard to go past a Feral Hop Hog- hoppy, bitter and so refreshing! Room for dessert? Try the homemade Kulfi: Cardamom, Honey & Pistachio ice cream- Yum! This entry was posted in A Match Plus. Bookmark the permalink.